We offer an extensive range of Elbow 45 Deg, 45 Degree Elbows Fitting which is made using quality stainless steel and carbon steel. These 45 Degree Elbow are widely used for the connection of fractional tube that ensures high working life. We offer our range of Elbow 45 deg in different sizes and grades as per the client specific requirements. 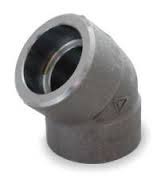 These 45 Deg elbows are widely used in chemicals, fats & fertilizers, sugar mills, and distilleries. Established in the year 2010, we Prime Forge & Fittings are a trusted firm engaged in Manufacturing, Supplying and Trading a qualitative range of SS Forged and Buttweld Fitting Products, Stainless Steel Flanges, Stainless Steel Olets, Stainless Steel Fasteners, Monel Products, Hastelloy Products, Copper Products, Nickel Products. We procure these products from some of the reliable and certified vendors of the industry who manufacture these products at their end using high-grade quality steel and iron, in compliance with international quality standards. In addition to this, our range of products is extensively demanded in various automobile, engineering and other industries and is appreciated for its sturdy construction, excellent tensile strength, resistance against corrosion & abrasion, durable standards, dimensional accuracy & stability and reliable performance.